Lots more Super Bowl cupcakes are coming your way this week leading up to Sunday's big game! (If you've made Super Bowl cupcakes, email us at cupcakestakethecake at gmail.com with "Super Bowl" in the subject line and include photo or link to image, price, full contact/purchasing information and we will try to get them posted). 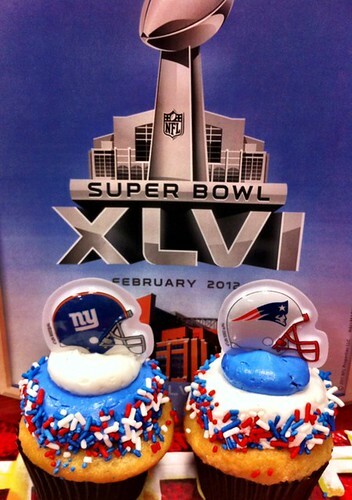 Sweet Avenue Bake Shop in Rutherford, New Jersey is selling both Giants and Patriots cupcakes for $4 each, chocolate or vanilla cake, available this Friday, Saturday and Sunday. Read more at their blog. Visit sweetavenuebakeshop.com for more information and call 201-935-2253 to place an order for your super bowl party (1 dozen minimum).